Notes: As in the first series, these episodes are in anachronic order; many of the events within actually occur prior to episodes from the first season. Fair warning as there is a large spoiler which may be the worst kept secret of 2009, which factors very heavily in the rating here. 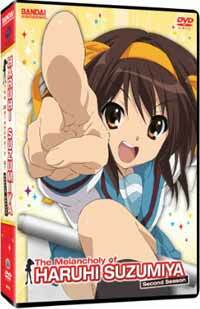 Haruhi Suzumiya is pretty strange. She believes in aliens, time travelers, and psychics ("espers") and has put a club together out of several of her (seemingly largely unwitting) classmates (the SOS Brigade) in order to search for proof that they exist. Of course the truth is often stranger than any normal person could ever believe - and it becomes the duty of the SOS Brigade to keep that truth just far enough out of Haruhi's attention that their world doesn't go completely haywire. This series is an anachronic continuation of the first series, which is an absolute prerequisite to viewing this one. You know, I was really, REALLY looking forward to this. While, unlike the vast legions of fanboys and fangirls who glommed onto this show, I *don't* consider season one of Haruhi to be the greatest thing since sliced bread, I still highly enjoy the quirky characters and interesting situations of this high school sci-fi scenario. The first series isn't flawless, but it is enjoyable, and for a good portion of the second season, the same holds true. Unfortunately, there is one massive, unavoidable flaw that almost entirely robs this franchise of the good will it has earned: the "Endless Eight" arc. In the original light novels, there is a point where the characters relive the same summer week an incredible number of times in a time loop. When it came time to translate this to the small screen, instead of trying the same episode twice, or maybe three times, which might have been forgivable, the geniuses at KyoAni decided to run this for eight episodes. Imagine coming to your television for two solid months hoping for resolution, only to find the exact same events every single week, with only minor changes in setting and costume (no, not even the recorded lines are different). Holy cow! It is for times like these that humankind invented the fast-forward button - not even the Japanese have the patience required to make such a terrible delaying tactic work (and for hardly any payoff at that). It's possibly the single worst directing decision I've seen in the last decade's worth of anime, and one of the most frustrating experiences I've ever encountered as an anime fan. That being said, whether or not you skip through or slog through that incomprehensibly repetitive set of episodes, the rest of this is setup for what happened in the first season, which in some ways is fun to see (ie the making of the film shown in the first episode) but in other ways is quite frustrating (the apparent regression of character relationships, easily explainable in that these events take place chronologically before season one). It's really a mixed bag, honestly, and the highlights come early ("Bamboo Leaf Rhapsody") and late (some of the film-making moments are priceless), but that's not to say this series isn't worthwhile. The technical specs are what one should expect from a late-2000s TV series - this never feels noticeably low-budget, though I feel that budget is particularly wasted on the minor cosmetic changes throughout the Endless Eight (and yes they animated different scenes for each episode despite the repetition!). Haruhi and crew always look pretty fantastic, but there's not much here to challenge the animators, either. And while I'm always keen on hearing Kyon's internal monologue (Tomokazu Sugita being as awesome as he was in season one), that was almost - *almost* not enough for me here. What this all boils down to is that, with the inclusion of The World's Worst Plot Arc EVER, these episodes don't hold up to the previous season's level of enjoyment. Take away that arc and you have what is essentially more fanservice (more in the emotionally pandering way than the physically titillating way) than anything else. This should have been a far better series and I still hesitate to call it outright bad (misguided is more like it) but this will strain the patience and goodwill of even the most devoted fans, though thankfully far better material is now available to continue this franchise in the form of The Disappearance of Haruhi Suzumiya (which will be, of course, discussed separately). All in all: as a continuation of an existing series, this is not quite a success, so it's best seen as supplementary, and a bridge to the next worthy story of the SOS Brigade. Recommended Audience: Some fanservice but nothing too out of the ordinary (even compared to season one). Kyon does stand up to Haruhi in one particularly intense scene, but there's little actual violence. Teens and up.